Triangle Fluid Controls Ltd. (TFC) is proud to announce its debut as an associate member into the Chemistry Industry Association of Canada (CIAC) – the voice of Canada’s chemistry industry. CIAC represents Canada’s leading chemistry companies including petrochemical, inorganic and specialty chemical producers, bio-based manufacturers, and chemical transportation. CIAC members are recognized as world leaders in the sustainable stewardship of chemical products. “Triangle Fluid Controls is happy to be working with CIAC members in sharing our unique knowledge of global chemical industry fluid sealing best practices to improve safety and reduce leaks and fugitive emissions in process piping and containment applications,” says Mike Shorts, TFC President. TFC has many years of process safety know-how from manufacturing sealing devices for the world’s chemical, petrochemical, food & beverage, pharmaceutical, rail and manufacturing industries. TFC recognizes the importance of CIAC’s Responsible Care® program in helping to reduce health, safety and process safety incidents and looks forward to working with CIAC. You may have heard this one before but size really does matter! Check valves should be specified for the current application and can be re-sized at a later date to fit future requirements. Valve sizing is by no means a new topic. Valve manufacturers have long recognized the importance of proper sizing and how often it’s misinterpreted in the field. It’s important to point out that unlike a standard open-close valve, check valves are flow sensitive. They are designed to allow fluid, steam or gas to flow in one direction. As the flow ceases, the valve’s internal disc automatically closes [see below video animation for more info]. Let’s say a project is over specified to use 6” piping where 4” would be suitable for its current use. In this instance, a 6” valve would be needed but is not the flow rate maximum (the maximum volume of media that travels through a pipe in one minute). A regular 6” valve used in this manner would be subject to pressure loss and would not fully open, causing it to flutter against its internal stop, making chattering sounds due to unstable flow. This will significantly shorten the valve’s lifespan by causing wear on the metal internals or by causing the disc to become stuck open, possibly leading to complete valve failure. Though less common, there are instances in which valves are undersized or under-spec’d which leads to a flow restriction. In order to properly size a check valve, you must have viscosity of material, media, pressure, temperature and flow rate (defined as: the number of US gallons of water per minute at 60°F that will flow through the valve with a pressure drop of 1 psi) to be able to customize a centre-guided check valve to the application – this involves changing the distance the disc travels from the closed to full open position. When the valve’s disc is stable and fully open or closed against the seat, no fluttering, chattering or excessive vibration will occur. DFT Inc. has a sizing program that uses the required information from above to calculate the required amount the valve must open to accommodate flow volume. This calculation is used to make a travel stop that is installed in the valve. The disc will be able to fully open against the stop, keeping it stable in the flow. For further reading on check valve sizing, we recommend reading DFT’s E-Book: “Common Mistakes in Check Valve Sizing.” If you prefer a more personalized approach to sizing for a custom application, fill out this contact form and a check valve expert will follow up with you. Proper sizing is essential and will ensure that the valve works at peak efficiency and will require less downtime, maintenance or result in a dreaded system failure. Happy Sizing! Triangle Fluid Controls Ltd. (TFC) is delighted to announce that they have donated a newly created holiday addition to the City of Belleville’s annual Christmas Lighting Display. Along with a Santa-level sponsorship, a team of TFC elves worked diligently through the summer months to come up with a festive light display to share with thousands of local residents. The annual lighting launch officially kicked off the holiday season on Friday, November 18th beginning at 5:45 PM at Jane Forrester Park in Belleville’s South-East end (near the city’s pier), and will remain lit through to the New Year.For a number of years, TFC has been happy to spread Christmas cheer throughout hometown Belleville, Ontario, by sponsoring the much-loved holiday creation that delights the young and young-at-heart and has become a beloved community tradition. The Christmas Lighting Display, originating from tragic events over 50 years ago, was built by a grieving family and epitomizes the true meaning of Christmas. Now operated by the City of Belleville, it is visited annually by thousands. It’s fall and for some, still warm – but it won’t be long until another heating season begins. Some facilities are already seeing the restart of boilers, and so, I’ve decided to address a cold weather issue that often arises with industrial steam and water boilers this time of year: they don’t start. Is there anything worse than a service call at 3 AM in January when the temperatures outside drop to -20°C? Once you have eliminated each component in your boiler as a possible culprit to boiler failure and it comes down to a check valve sticking open or closed in your system, it’s time for a replacement. Each boiler is unique in the way it is designed and your choice in replacement will be somewhat dependent on the specifications your system requires. Whether you have a liquid, gas or steam boiler, this introduction to DFT Inc.’s three most common check valves for HVAC service is sure to get you warmed up to a replacement valve. Note: DFT also manufactures check valves for use in large industrial boiler systems. A complete guide can be found here. This proven check valve is suitable for a wide range of applications and is extremely versatile due to its ability to work at various pressures and temperatures. The Basic Check Valve can be made in different grades of stainless steel and is available from ¼” – 2 1/2” line sizes. The basic check can be used in installations requiring a CWP of 450-6,000 psi. DFT also manufactures the Basic Check with higher cracking pressures, from 2-40 psi. While the Basic Check is versatile, be sure to reference DFT Inc.’s full Catalogue for certain restrictions. The most common check valve for use in steam applications, the SCV is also commonly used with liquid and gas. It uses the same trim as the Basic Check, in a durable body made of either 316 stainless steel, Alloy 20 or Hastelloy alloys with either FNPT or socket end welds. DFT SCV’s are available for ½”-3” pipe sizes and either 750 or 3,600 CWP. The SCV-R (Restrictor Check) is designed for higher cracking pressures than the standard SCV check valve. For a more simplified and flanged version of the SCV check valve, available in ASME Class 150 and 300, see DFT’s DLC check valve. If you have an existing system with limited space – check this little space-saver out. 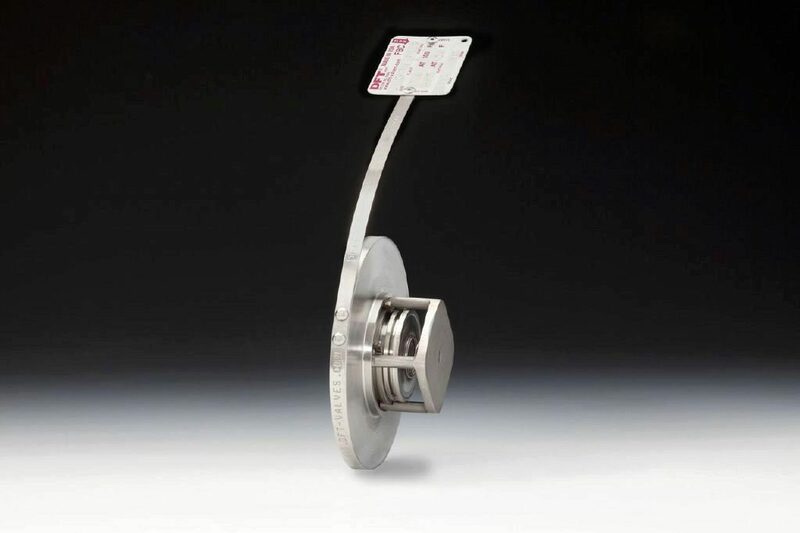 The FBC “insert wafer” check valve is designed to be installed between two flanges and uses the same proven technology as the Basic Check valve. Though small, the FBC is made to last with stainless steel construction and a well-protected spring, not to mention the FBC can withstand temperatures up to 232°C (450°F). The FBC check valve works with schedule 40 pipe in the most common sizes 1”-4”, pressure class 150/300. The simplicity and durability of DFT Valves has been proven since the original design dates back to the 1940’s and remains unchanged to this day. The non-slam, spring-assisted design prevents reverse flow and virtually eliminates water hammer in your system. All of DFT’s check valves are capable of water-tight shutoff, are easy to maintain, can be installed in any direction and are built to last. Our distributors and end-users tell us that “they last too long” and regularly comment on their unsurpassed design and efficiency. If you would like to learn more about DFT check valves for industrial steam, water or HVAC, let us know, we’re here to help. Triangle Fluid Controls Ltd. (TFC) the manufacturer of Durlon® sealing products, is proud to announce that the sanitary “white” version of its flagship product, Durlon® 9000N, has been successfully tested and certified to USP Class VI standards for use in the in the pharmaceutical and biotechnology industries. USP (short for United States Pharmacopeia) Class VI is a series of biological tests, requiring a product to show minimal to zero levels of toxicity, making it a suitable gasket material for use in medical devices and other applications where a ‘hygienic’ material is required. Like the rest of Durlon’s PTFE material, Durlon® 9000N is FDA compliant, making it suitable for use in the pharmaceutical, chemical, food and beverage, and biotechnology industries. Offering USP certification among the Durlon® line of products, allows TFC to better meet the unique needs of its customers who span across a wide range of industries. For more information about Durlon® 9000N, please contact Triangle Fluid Controls Ltd.® at 1-866-537-1133, or [email protected]. Yet Another Promotion Announcement at Triangle Fluid Controls! Congratulations to Damon Wright, who has been promoted as TFC’s newly established Manufacturing Manager, announced August 17th, 2016. The former Warehouse Technician joined the company in 2013, and quickly proved himself an asset to the global gasket manufacturer. “Damon has accepted any and all challenges thrown his way and has excelled at completing them. He’s a key contributor to TFC’s team and is greatly respected among our staff,” says Mike Boyd, TFC Plant Manager, who will in October transition to General Manager of TFC. Damon’s new responsibilities will include overseeing and controlling all aspects of plant production operations including costs, efficiencies, hiring, and improving on processes and procedures in order to meet organizational goals and consumer demand. The restructuring of TFC’s management comes as a result of a number of internal managerial promotions within TFC and across its’ privately held sister companies. TFC is currently recruiting for a Warehouse Technician at its Belleville, Ontario plant. A full listing for the position can be found here, or by e-mailing [email protected]. Also in attendance at the award ceremony, was Randy’s son Brock, representing the McKay family. Brock was also awarded a glass sculpture on behalf of TFC, for his father’s dedication to the company. “This place [TFC] meant a lot to him. It was inspiring to see someone who had such a passion for what they did,” remembered Brock. The award included two pieces: an engraved glass plaque and hand blown glass sculpture made similar in shape, style, and colouring to TFC’s company logo. A second plaque will hang in TFC’s lobby with each year’s winner added to it. The making of the pieces, commissioned by a local glass blower in Prince Edward County, was completely documented and can be found posted online on TFC’s social media channels or by clicking here. Fugitive emissions are a red hot topic right now – and for good reason. With ever-increasing environmental awareness, leakage and how to prevent and reduce leaks should be on everyone’s mind. As a gasket manufacturer, it is Triangle Fluid Controls job to design, develop and educate end users on products that can help them meet upcoming low emission regulations. Continue reading to determine the best option for your application. Reducing the gasket area is extremely effective and usually one of the easiest ways to increase gasket load, when not enough load can be applied to the gasket. Remember that Pressure= Force/Area, so if we can decrease the area, the pressure (in this case the seating stress) will increase. Specifically, the Durlon RCA (Reduced Contact Area) gaskets and Durlon PTFE Step Ring gaskets are designed based on this concept. Both types of gasket are fairly unique, even though they reduce gasket area so that the gasket stress is increased. Durlon RCA type gaskets are ideal for full face (FF) flanges and FRP piping that require a tight seal, however, they cannot handle high bolt loads generally required for fugitive emissions or critical sealing applications. The skeleton of the RCA gasket resembles that of a full face (FF) one, except a large portion of the non-critical gasket area is removed for optimal sealing performance. Durlon 9000 Step Ring gaskets are like a ring gasket, except a portion of the sealing area is reduced by machining it on a CNC lathe from one piece of material. Traditionally, these type of gaskets are manufactured by laminating two gaskets of a thinner gauge and various size together with an adhesive. Aggressive chemicals, such as sulfuric acid, can quickly eat away at the adhesive after installation, which can lead to a premature leak path. PTFE Step gaskets are commonly found in sulfuric acid plants, and applications for PTFE Step Rings include 150# raised face (RF) (Floating) Lap Joint flanges, as well as MondiTM ductile iron sulfuric acid piping. In cases where the gasket area is already minimal and cannot be changed by design, or if reducing the gasket area simply isn’t enough, selecting a controlled swell material is a great option. These types of material really shine in low load applications that involve oil and water. Once the gasket is installed, the material swells when it makes contact with oils, fuel or water, which increases gasket thickness. As the material begins to “swell”, the gasket starts to expand, exerting force in both directions, against the flanges. Imagine a Belleville washer being compressed: by design, it applies force in the opposite direction, over the entire gasket-media contact zone and not just the fastener point-load zone. In theory, this is what a controlled swell material is doing. Durlon DuraSwellTM 7760 is a prime example of how choosing a high performance sealing material can negate less than ideal gasket sealing loads and still achieve a tight low to zero emissions seal. So, can low stress sealing applications meet fugitive emissions requirements? My answer is absolutely. As always, I recommend contacting your gasket manufacturer and providing all of the necessary application details. This will allow a specialist to recommend the proper material and installation methods to ensure the best performing sealing device for your specific needs. Until next time, stay safe out there, and keep the fluid between the pipes! How long will a bolted flange connection last?